Enjoy live DISH® HD TV wherever the fun takes you with the DISH® Tailgater portable satellite TV antenna and DISH® Wally HD satellite receiver. Designed for sporting and outdoor enthusiasts, the DISH® Tailgater is ideal for watching the big game in parking lots, campsites and more. 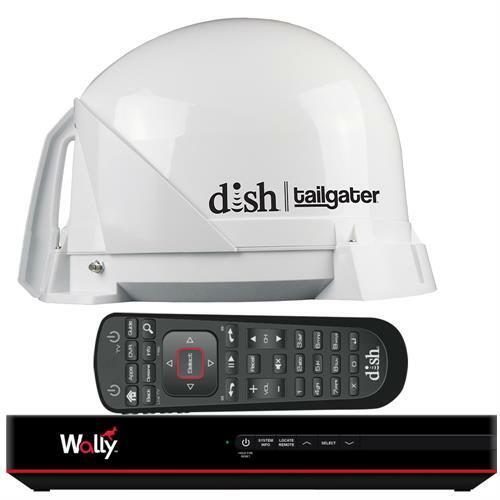 The Wally HD Receiver has Wi-Fi capability (USB Wi-Fi adapter sold separately) that allows you to connect to a wireless network to enjoy streaming videos and other web apps. The automatic-aiming antenna is easy to set up and works right out of the box. Payment is simple, too. With no contracts and no extra fees, the pay-as-you-go plan from DISH® only bills you for the months you use. When the season ends, simply cancel the satellite service at any time without penalty. Already have DISH® at home? Just add the new receiver to your account for one bill. You'll never have to be without TV again. Call DISH® to see if local channels are available in your area.